‘The Mighty Handful’ were ever suspicious of the conservatoire system, but also of the status quo of European musical life at the time, and not least the all-pervasive Richard Wagner. The year after Rimsky-Korsakov completed Scheherazade, he was able to hear a work which had been absorbing him for some time—Wagner’s Der Ring des Nibelungen. The great Wagnerian Carl Muck conducted the cycle in St Petersburg during the 1888–89 operatic season and Rimsky-Korsakov sat through the rehearsals and saw his view of music-drama radically altered. From the early 1890s until his death in 1908 he produced a dozen operas which range from the historical epic, through legend, fairytale and folk treatments to fascinating experiments in the genre. 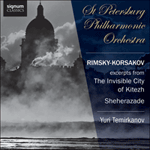 His masterful penultimate opera, The Legend of the invisible city of Kitezh and the Maiden Fevroniya fits into almost all of these categories at some point or other.